I only had one day of work after returning from my trip. I drove all day Monday (after working all day Sunday), had Tuesday and Wednesday off, and had a previously scheduled vacation day on Friday. That just left Thursday. J had made plans for dinner with some of her friends and the kids. I guess I was invited but if she doesn’t force me to go to these get togethers, I usually don’t go on my own. I would have been way late for dinner anyway. I was working out near Parchment that day and when I got off work, I started thinking about what I was going to do for dinner. When J does her thing with friends, I’ve been trying to find bars that I wouldn’t go to with her or the kids for dinner. I still have a few on my list but I wasn’t digging the bar thing. I knew I was passing a Chicken Coop on the way home and chicken actually sounded good right then. 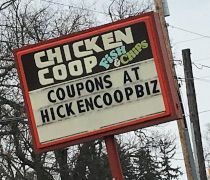 The Chicken Coop is a chain of restaurants in southwest Michigan and, honestly, they’ve always been pretty hit or miss for me. I had never been to the Nazareth Road location and it was near where I was working that day just off Gull Road by the old Nazareth College campus. The building is small and has that distinctly 80’s fast food look with the two tiered dining room. The lower level has large windows that wrap around to the top giving you a lot of sunlight and some natural warmth on those cold days. 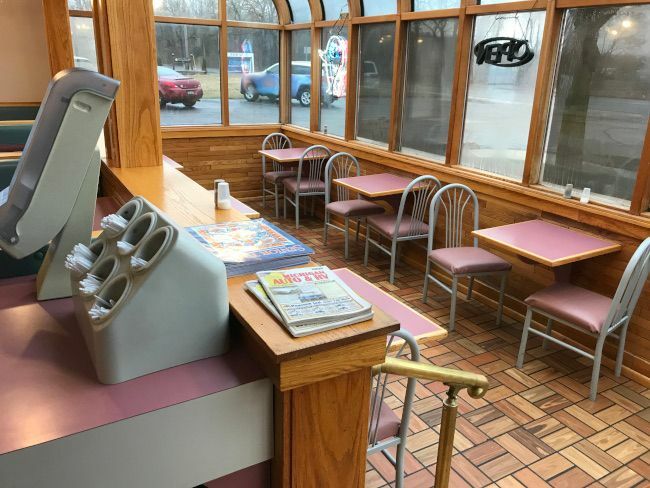 The floor and the furniture also have that very 80’s fast food look with a Pepto Bismo pink being the color of choice. 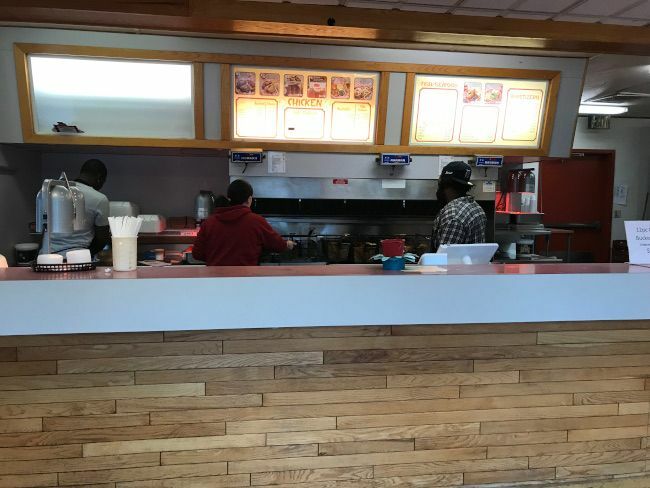 The order counter is on the top level and right in front of the deep fryers so you can see everything being cooked. There were a few people ahead of me when I walked in which gave me time to look at the menu. I knew I didn’t need a bucket because it was just me eating but I also didn’t want chicken strips either. 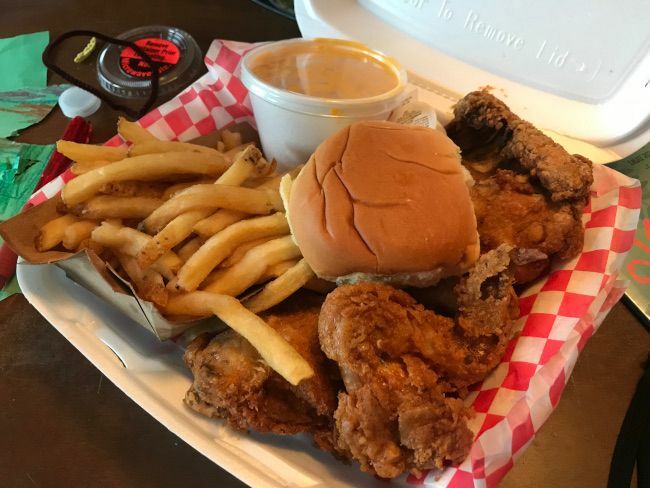 I ended up ordering a four piece chicken dinner which got me two sides and a roll. The meal set me back a little under $10 and took about ten minutes for my meal to be boxed up and handed to me. I started in on the chicken first when I got home. The four pieces was one of each of breast, thigh, leg, and wing. The chicken had a very crunchy, very tasty breading on the outside and the meat was super juicy. There was a little bit of a soggy, greasy, flour between the meat and the breading but not enough to even start to be a turn off. This was probably the best Chicken Coop chicken I’ve had since the Westnedge location ceased to exist. The sides were pretty much just filler as neither were really anything special. The first one I picked was fries because I always pick fries. 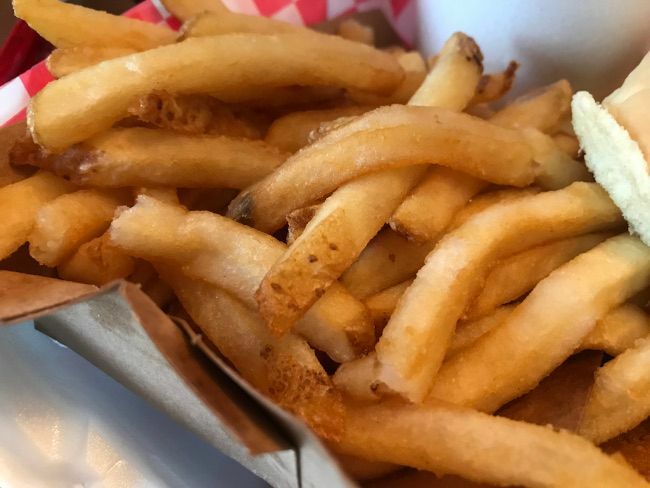 They’re simple, skin-on frozen fries that were tasty enough to not need a condiment other than the little bit of salt they use and some extra chicken grease. 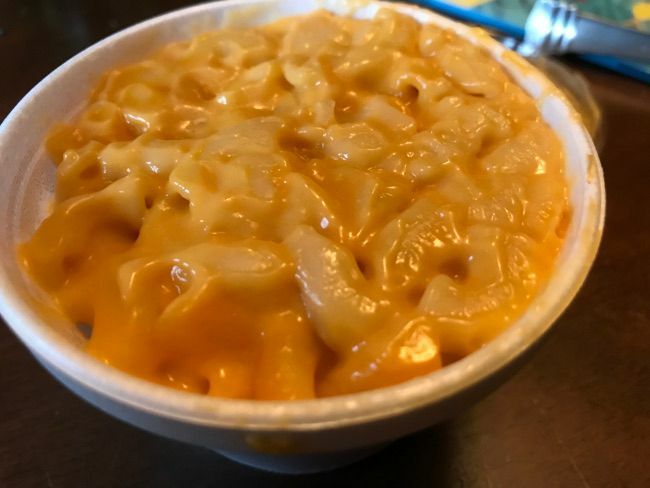 The mac & cheese had a very processed taste to it but it’s very creamy and very cheesy. This is the kind of mac & cheese my kids would really like. It sort of tastes like Kraft but it’s clearly not Kraft. 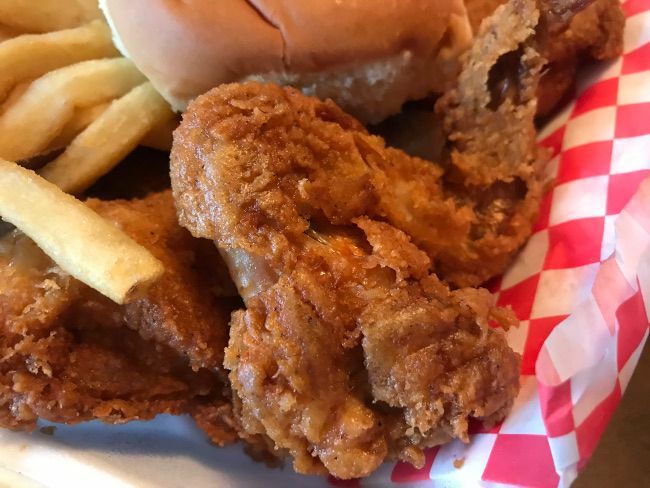 This was probably the best Chicken Coop experience I’ve had in a while. I don’t have very high expectations when I walk in to a Chicken Coop anymore. I’ve had so many so-so meals that that’s just what I expect. I keep going back because it is good chicken and it’s a very filling, cheap meal. 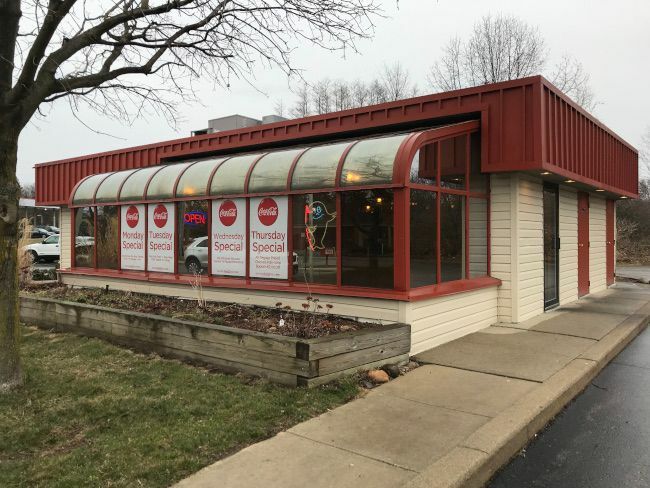 The Nazareth location just came under new management so I don’t know if this is a new thing at this location or what, but this is definitely a Chicken Coop I’d go back to when I’m in the mood for delicious, crispy fried chicken.